Hair follicle: A sac from which a hair grows and into which the sebaceous (oil) glands open. 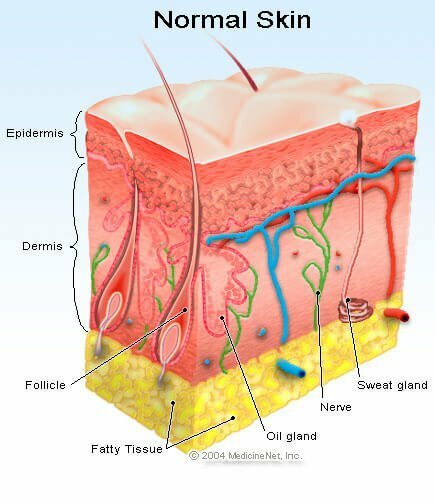 The follicle is lined by cells derived from the epidermal (outside) layer of the skin. Each follicle normally goes through a five-year cycle of growth and rest, with about 90% of the follicles growing hair at any one time, averaging about six inches (15 cm) of growth per year. Derived from the Latin word follis, for bag. "The human hair follicle is a dynamic structure that generates hair through a complex and exquisitely regulated cycle of growth and remodelling governed by numerous genes," Siobhán A. Jordan has noted in Molecular Medicine Today.